The Focal Listen ticks all the right boxes, offering excellent sound and build quality at a mostly affordable price. You may not have heard of French audio company Focal, but they're actually a highly regarded speaker manufacturer. The company has since branched off to create headphones, sound bars and even car audio systems. The company's first pair of headphones, the Focal Spirit One, were lauded for their balanced sound and great build quality. So its successor, the Focal Listen, has some big shoes to fill. Thankfully, the Focal Listen continues the company's streak of making a great-sounding, well-built headphones for an affordable price. It's by no means perfect, but it's an extremely compelling option for folks looking at a sub-$300 (sub-£200) over-ear pair of cans. The Focal Listen feature a more understated design than its predecessor that some might say borders on generic, depending on your tastes. I, however, like the understated design and focus and I wouldn't be embarrassed at all wearing these on the train, even if that comes at the cost of some personality. The Listen is made mostly of plastic but it manages to still feel like a premium product. Gone are the folding metal hinges of the Spirit One, which is a shame as the Listen can only fold up for travel. Speaking of travel, Focal includes a soft case and an airplane adapter with every unit, but that's about as far as it goes for accessories. On the left earcup you'll find a port to connect the replaceable headphone cable. This is a great feature to have since you only need to replace a fraying cable instead of the entire headphone. The included cable features a microphone, single-button remote and terminates in a 45-degree 3.5mm headphone jack. While I love the replaceable cable, I find Focal's positioning of the remote to be awkward. It's a bit too far away from the mic and rests in the middle of my torso when I'm standing. I'm used to grabbing remotes that are integrated with the mic so it took a while to retrain my brain to reach further down. The remote also doesn't have volume buttons so you'll only be able to play/pause, skip and use Siri/Google Now with its single button – a sore spot considering that many headphones half its price are capable of just such a feat. The Listen features leather ear pads that feel great on the head, however its headband is made of rubber, which is noticeably less comfortable than the leather headband of the Spirit One. Had Focal used foam and leather for the headband instead of rubber, the Listen would've been far more comfortable to wear during extended sessions. But, as it stands now, it's hard to go for more than a few hours before I need to cool off for a bit. Listening to The Last Shadow Puppets, an alt rock supergroup from the UK, I found I could hear the different layers of music and was able to pick out the position of each instrument. Surprisingly, the Listen provided a great sense of space for a closed-back pair of headphones. To test the Listen's highs, I put on some Andrew Bird for his liberal use of violin and whistling. The Listen was able to capture the timbre of Bird's violins, but lacked the supreme level of resolution of more expensive headphones. I also encountered some sibilance on some tracks, so some listeners may find the Listen's highs a bit piercing at times. Listening to bass-heavy tracks from Sam Gellaitry, the Listens impressed me with their ability to dig deep and provided a good level of impact. Bass is textured and refined but it won't rattle your skull like the Razer Hammerhead Pro V2 or Beats Solo 2. 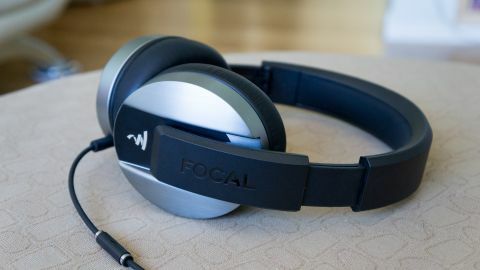 The Focal Listen also feature great sound isolation, which is great for commuters. There's no active noise cancelling, but I was able to tune out a noisy coffee shop without turning the volume too high on my OnePlus 3. That said, while the Listens are easy to drive from your mobile device they do sound slightly better when paired with an amplifier like the Fiio E18, WooAudio 3 or Creative Sound Blaster E5. The Focal Listen offer wonderfully balanced sound and great noise isolation. They're made of plastic but that doesn't do much to detract from them feeling durable and premium. Focal did an amazing job with the Listens and I highly recommend them for those looking for a great overall headphone under $300/£200. One of the largest snags I hit while testing the Listens was when they got a little uncomfortable after long listening sessions with its rubber headband putting pressure on the top of my head. Clearly leather was the way to go here. Its remote is also placed at an awkward length on the cord. It's not a dealbreaker but, if you've built some muscle memory around where to look for a remote, you'll need to do some retraining. Some tracks also exhibited slightly piercing highs, which may bother treble-sensitive listeners. Overall, the Focal Listen offer a thoroughly enjoyable listening experience. I love their balance, build quality and understated design – they may not be as high resolution as the Pioneer SE-MHR5 and other headphones capable of High-Res Audio playback, but their sound-to-dollar ratio is impressive. At $250 (£150, AU$329), however, they're not cheap but you actually get a lot for your money (see: sound and build quality). As the baby of Focal's headphone lineup, I can only image what the company's $4,000 (£3250, AU$5259) flagship Utopia headphones sound like. Bose, Beats and other competitors in the premium headphone game better look out. Should Focal continue to pump out cans that provide balanced sound and top-notch build quality at an affordable price, audiophiles might look more and more in the French company's direction.